Q) You two put so much time and energy into everything you do. I thought I’d start out by asking what holiday activities you chose to invest yourselves in, separately and as a couple? A) This Christmas holiday season has flown by us so fast, we, unfortunately, didn't get everything done that we wanted to do in preparation for it. Individually, Elizabeth did all the decorating of our home and did a great job doing so even though she has been in a lot of pain from rotator cuff surgery performed last June. It is taking a longer period of time to heal due to the serious nature of her injury and the toll diabetes has taken on her body over the years. It didn't help to have a visit from a flu bug that made its way to both of us during the time, either! 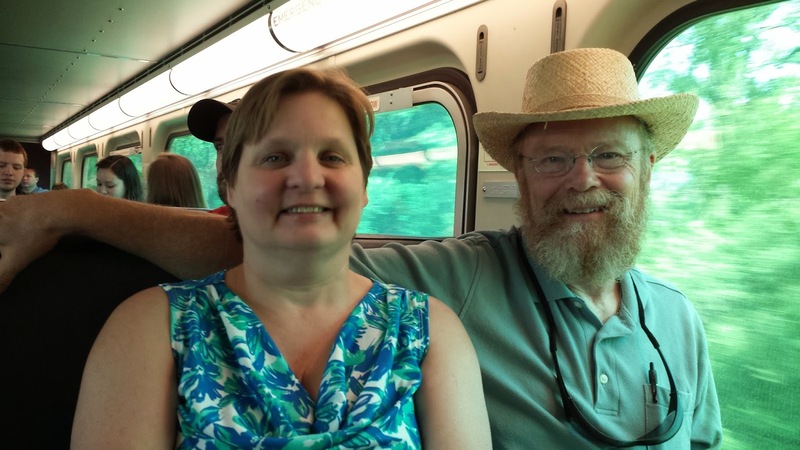 As a couple, we celebrated part of my vacation traveling down to St. Louis, Missouri, on Amtrak, to visit my 94 year old mother and my brother (before the floods came). It was special to do this because this was the first year working for the railroad that I have had enough seniority to request Christmas week off. It was also the first time Elizabeth and I had not only traveled somewhere for Christmas, but taken the Amtrak anywhere since I left them to join Metra ten years ago. The trip was great! We were joined by our youngest son, who flew in from Dallas. The three of us traveled by Amtrak back to Chicago on Christmas Eve to celebrate Christmas with our two other children. We also had the delight during this season of hosting our oldest son and his girlfriend for a dinner and a concert by Sarah Groves, a well-known Christian songwriter and singer. One of the highlights this season for Dan was hosting a Christmas party on his evening commuter train shortly before going on vacation for a small group of passengers and co-workers he has had the privilege to get to know over the last couple of years. God has put them on his heart and grown in love for them. The party was a simple way of showing that. His heart's desire is to live Christ among them and love them to bits in the hope that someday they will see and understand how precious they are to God and accept his priceless gift of the cross into their hearts. Dan was blessed with an opportunity, also, to visit and minister with his cello to an individual from church, who is in hospice. It has been a great holiday season of blessings for which we are deeply grateful. Q) What parts of your life keep you bonded as a couple? How do the separate elements play into this? A) Without question, the most powerful force that has helped us bond as a couple from the very beginning in our marriage has been our individual and corporate walks with the Lord! With his strength and power we have stayed together through the years, even with a two-plus year separation. It has been God who has enabled us to do this, for without him, we would not been able to come close to trying to keep the vows we made in the beginning. Our common, consistent faith in the strong anchor and the Grace to continue to hunger and thirst for God, to be desperate for him enough to maintain our spending one-on one time with God frequently and be involved with his people in a good church, has been the key. And this is a gift from the Lord, not because of any steadfast personal strength! Without this gift of himself, we would not have had the strength or motivation to make it through the times of great difficulty, past and present. It has also been helpful to find a hobby that we are both passionate about. This, too, has been a gift. For us, it has been an enjoyment of horses. We have been very fortunate to enjoy them together and to serve each other in making this a reality. This has been a recreational intimacy. Q) You’ve had some health concerns as you’ve reached the “over 40” status of life. I loved the newspaper article on Dan’s replacement surgery. But how have you two “danced” together in marriage through the pain and healing you’ve both experienced? A) Our physical and emotional health has had a powerful impact on our marriage through the years. We both brought backgrounds that have presented hurdles to emotional intimacy. Elizabeth's diabetes and Dan's recent surgeries heavily affected life's routines. Every marriage experiences these challenges at some point, and in various degrees, yet facing them is part of the journey together. In our marriage, these have been opportunities to learn to love and serve each other. They cannot be denied or fled from, and part of our "dance" together is striving to grow to help each other in sincere love in the many needs these challenges present. Q) Elizabeth and Dan, you both give so much time as volunteers. How do you juggle everything else and volunteering? A) It is true that Elizabeth and I are involved in volunteer activities. We try to work around each other's passions to minister and serve in what we feel are things God has seemingly called us to. There is a mutual respect for each other's feelings in going about this. To be sure, it is part of our "dance," and there has to be constant effort on both of our parts to allow more time together for our marriage, by communicating about our days and how they went and about things coming up that will affect schedules and allocation of time in shared priorities and needs - individually and as a couple. Q) Music, I know, is important to both of you. Dan is learning cello after playing baritone all these years with the Lakeland Brass. What other hobbies keep you busy, especially those you pursue together? A) It is good that Elizabeth enjoys me practicing both musical instruments because I have had to increase the amount of time devoted to learning a new instrument as well as maintain and prepare for performances on the baritone. She enjoys listening to the music in the home, even with all the squeaks, mistakes, and repetitions! Knowing this has been of great encouragement to me to continue with both, for there are times of discouragement. I try to be sensitive to her activities such as time of day and her desire to watch certain television programs. Other activities, in addition to horses, that we enjoy doing together include eating out and watching movies. Elizabeth enjoys board games a lot and it’s good for us to engage in these. Time spent playing those games together allows us better opportunity to communicate with each other. Q) You two often travel to the barn together on weekends. You both love horses so how has that played into your marriage? A) Our shared love of horses involves helping each other in our favorite activities with them. 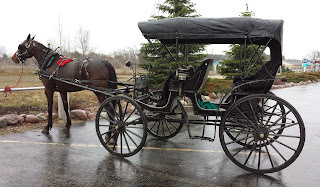 For Elizabeth, it is riding (Western-style) and driving a horse and buggy for me. Elizabeth has, unfortunately, had to cease with horse activities due to health for a long time. We hope she can again pursue riding again. She has been a huge help for me in the past when preparing the horse and buggy for an afternoon drive, with its myriad of necessary tasks. I hope she can regain full use of her shoulder someday so she can help me once again. The cool thing about having a strong interest in the same thing is that it isn't confined to, or dependent on, being able to participate in it especially in owning a live horse and all that is associated with it. This is an interest that can be enjoyed by attending many related events taking place in a regional area, and even traveling to other regions and continents. This, I believe, would be true for a lot of many other interests a couple might have together. For us, this interest has provided a therapeutic outlet both individually and as a couple. It has provided a broadened opportunity to interact and bond together. Final question, I promise! What would you say are the top two marriage building insights you’ve learned through three and a half decades? A) I would say the number one of the two most important marriage building insights would be each spouse's personal walk and growth in their relationship with Jesus Christ. Our foundation on a daily basis has to be receiving the spiritual feeding we each need not only for ourselves, but for our spouse, our children, and the others God has and will bring into our lives in order to live out the tremendous love, mercy and grace God has poured out lavishly on us during our numbered days on this earth!! We desperately need a power beyond ourselves to help bring his kingdom, that is, his love, mercy, and grace to this world, and it starts with God's power in each of our lives first. We all deeply need life giving motivation, strength and endurance spiritually, emotionally, and physically (to whatever degree he has chosen) to meet the commitment marriage requires. The second most important marriage building insight would be communication between husband and wife. Our lives are " fearfully and wonderfully" designed by God, himself, with all the differences and complexities involved. Communication between two in a marriage requires trust and clarity in order to achieve oneness in spirit and the capacity and ability to show Christ to a world truly lost to eternity. Thank you, Dan and Elizabeth, for being highlighted on the Extraordinary Ordinary blog! There are more extraordinary tales of ordinary folks featured here once a month at www.lookandbe.blogspot.com. If someone you know would like to be featured, please contact TLC Nielsen at soulfixer 13 (at) yahoo (dot) com and put “lookandbe nominee” in the subject line. Merry New Year!